We landed back in the UK from Spain on Saturday to our traditional welcome of varying forces of rain and wind with temperatures staggering up to the dizzying heights of 12°C. Yuk! Bloody marvelous! Mind you, our trip down to Alicante airport to leave Spain was mostly covered by threatening clouds, though it was considerably warmer. First, we visited Singapore and Cambodia in late February and hoped to return to the beginnings of spring. Failed! Now we’ve been to Spain in late April hoping to return the beginnings of spring and apparently failed again. 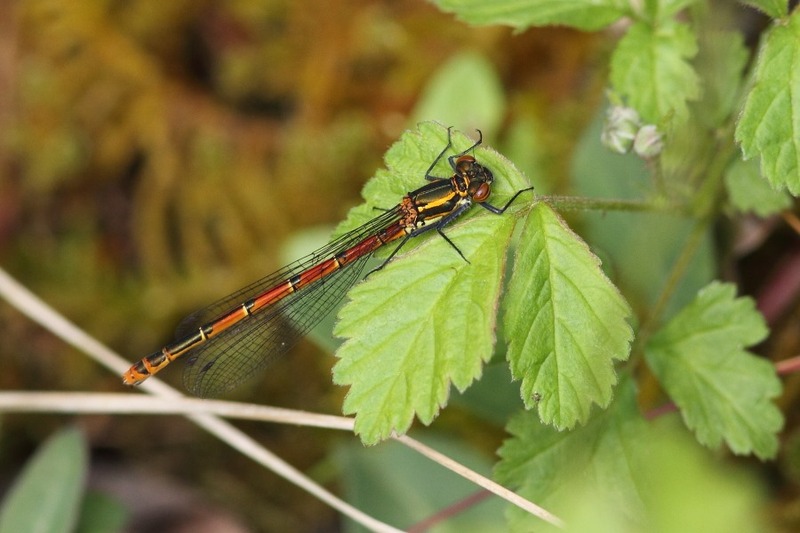 Anyway, before Sunday’s rain began, I went to check my favourite local patch, Sandhouse Lane NR, and, after a worryingly quiet start, we spotted about 6 Large Red Damselflies (Pyrrhosoma nymphula), lurking about the main Odo pond. In these temperatures, they were trying not to be very active but they were also tricky little devils to pin down with pixels. We’re back to my favourite “one pair of eyes is not enough” syndrome. Keeping your eyes on your quarry whilst moving ones feet and monopod-mounted camera on a bramble-covered 45 grassy slope is decidedly tricky. Nonetheless, I managed it on a couple of occasions, at least well enough to capture a sample shot of both male and female. Incidentally, whereas in early spring last year the main pond at Sandhouse Lane was as low as I’ve ever seen it, i.e. completely empty, this year is quite the opposite situation; it is now as full as I’ve ever seen it, a noticeably wider body of water. If the weather will perk up, it should be a nice little habitat again. We continued into the industrial wasteland of the adjoining old tarmac plant (this was in use while the original section of the M1 motorway was being constructed) where there are several depressions that tend to fill with rain and provide more habitat. Though I was surprised at how little water there was here, we did find some with water and spotted another few Large Reds. 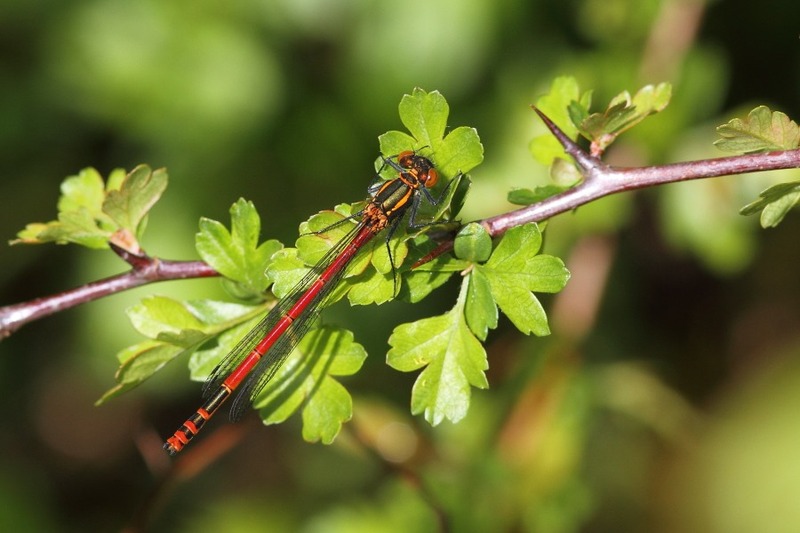 Whilst in Spain, I had received email notification that Bedfordshire’s first Large Red Damselflies this year had been spotted on 1st May. The individuals that we found, 18 in all including a few around neighbouring Jones Pit on a permissive path [clever of them to stick to the permissive path :D], displayed mixed colour maturity, some looking pale and fresh whilst others, like those above, were fully coloured. Our Spanish hosts, who had returned to England visiting family, told us that England should be in for a good summer “because the crows were nesting high in the trees”. I do hope they are right but, with the current situation, I must confess to misgivings.